I haven’t done a skincare related post in a hot minute, which for a skincare junkie like me, that’s crazy! So to rectify that insane oversight, I wanted to talk to you about acids and more specifically the beauty of acids because they aren’t that scary. I promise! I will share with you a couple of the acids that I use and the benefits I’ve seen over the past few months. Hopefully, this will give you some clarity over acids and maybe you might investigate ones that work for you. When you think of acids you may think of the chemical mixtures that could cause you serious bodily harm. Nope! Not these acids. What I’m referring to are a group of acids that are actually beneficial for your skin and they are, alpha hydroxy acids (AHAs). AHAs are generally derived from milk and fruit sugars. Yes, my beauties, milk and fruit contain acids that are good for us. These acids exfoliate your skin chemically, which penetrates your skin at a deeper level instead of a manual exfoliation. This is great if you have a bit of texture and want to smooth out your skin. It’s also great for preventing wrinkles from forming and if you notice the fine lines have started to make an appearance. AHAs are also beneficial in stimulating collagen production in our skin which depletes as we age. As you know collagen is the ‘thing’ that gives a youthful appearance. Whilst there are quite a few acids that fall under the AHA umbrella, the ones that I have tried are lactic acid and glycolic acid. I wanted to ease myself into acids and what I found was that lactic acid was the way to go. Being the gentler one in the family, it takes a bit longer before you notice real results, however, it does make a difference. 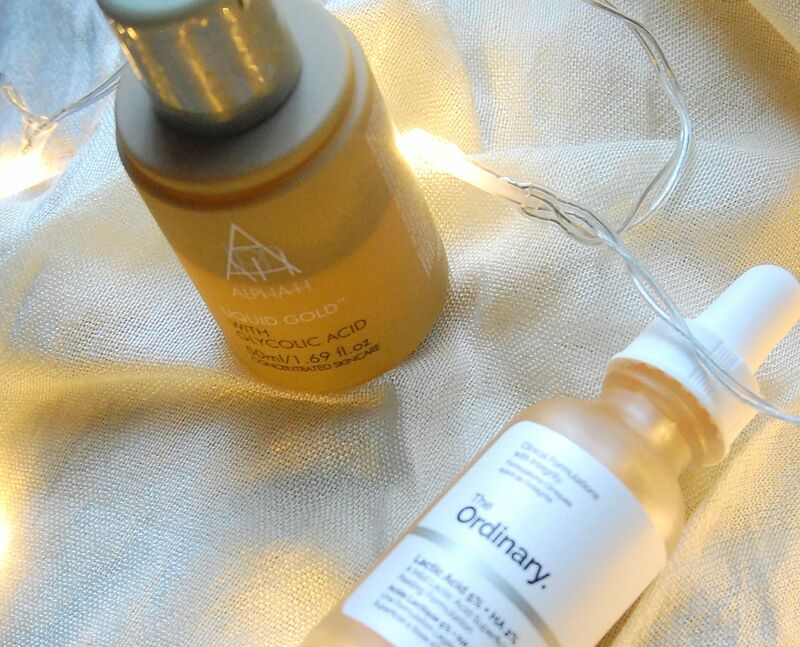 I went with the cheap and cheerful Lactic acid 5% plus Hyaluronic acid from The Ordinary. This product contains Tasmanian pepperberry which aids in reducing irritation. Verdict – my skin is normal/combination with a bit of sensitivity and I had no issues with irritation or burning sensations. I noticed my skin feeling a lot smoother and softer after about 3 weeks of consistent use. After months of using the lactic acid, I wanted to join the glycolic party and started checking out Alpha-H liquid gold. As luck would have it, a friend got one in an advent calendar but didn’t want it so I got it! Thanks, Elle! Glycolic acid is a lot stronger that lactic acid and you only need to use it every other day at night. Verdict – I noticed a difference within a week! I love this stuff and once my microblading heals I shall resume use. I took it with me to Trinidad and it coped with the 29 degrees, which is awesome! All in all, I’m pretty comfortable using AHAs and actually find them easy to incorporate into my skincare routine. If you decide to dip your face into these acids please ensure that you have a good sunscreen. Make sure you find the right acid that works for your skin and hopefully you find the beauty in acids. Have you tried AHAs before? What did you think? Let me know in the comments below and if you aren’t already signed up to the newsletter be sure to sign up. As always, thank you for reading and until next time, be well!